Marken is no longer easily accessible across the ice of the Gouwzee because the thaw has set in. Because of the thaw the ice has also begun to drift and because of the pressure some quays were destroyed. For this reason it will be impossible or difficult to provide aid in case of a possible flu epidemic. To overcome this problem beforehand the local general practitioner, doctor Pasdeloup(? ), vaccinates everyone over twelve years. SHOTS: - From the harbour of Monnikendam(?) 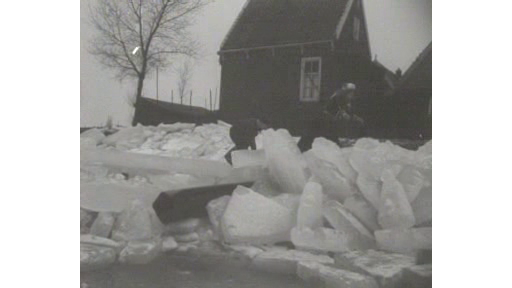 an ice punt (a type of ice sailing boat) glides across the ice of the Gouwzee to Marken; - ice floes are stacked against the dyke right up to the houses; some children(?) in traditional attire stuggle to climb over the floes; - men, women and children in traditional attire come walking to the doctor's house through the snow; everyone takes of their cloggs and leaves them with the many cloggs that are already there; in the consulting room everybody is vaccinated.